The idea of viewing quilts created for 9-11, one of the most life changing events in American history, filled my heart with curiosity and apprehension. Curious about how sew-ers would treat the harsh subject matter with the softness of fabric. Apprehensive about my own frayed emotions being exposed. Yet, I traipsed to the Smith Village in Chicago with other women to hear June Forte speak. Full of passion for the fallen, June Forte presented a power point of the Pentagon attack of September 11, 2001. As a professional working in the building, Forte fought the dust, debris and confusion that all employees encountered as they stumbled out of the crumbling structures. Having served as an enlisted photojournalist with the Army’s 4th Infantry Division, and in other military positions, Forte was no stranger to thinking clearly in emergency situations. Her descriptions of the events of that fateful day, when 184 persons lost their lives, left the audience misty eyed and sober. She brought the weight of the losses to rest in the room. Then, Forte spoke of a nation trying to grapple with grief. 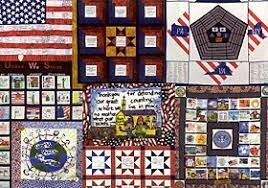 Her voice filled with amazement as she disclosed how one-by-one, quilts spontaneously arrived at the Pentagon. Unbidden. From the hearts of freedom-loving people. Expressions of soul –wrenching anguish, compassion and hope. Needing healing from frayed emotions as the scraps of the Pentagon filled news reports, quilters across America gathered patriotic hued fabric and put the needle to work. Seasoned sew-ers and first time stitchers pieced together comforters to honor the people who died or were injured in the attack. 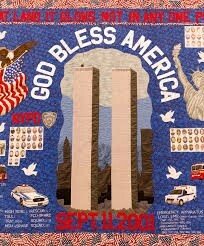 The sewing machines whirred as seams pulled together red, white and blue tributes to the rescuers and first responders. The 150 quilts in the Pentagon Collection bind this nation into a unified pattern again. They represent a warm hug as people recover from the trauma of 9-11. June Forte presented a power point of the quilts. As each masterpiece of fabrics filled the screen, Forte told the story behind the stitching. The rationale for the design. The unity of a community project. The tear stains from a lonesome sew-er. After nearly two hours, the impact of visually seeing the quilts finally mended the wounds in my own heart that had been repressed for over a decade. 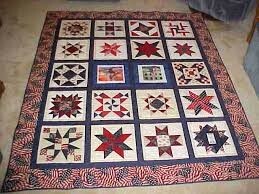 For me, the Pentagon quilts will represent the binding up of a nation. 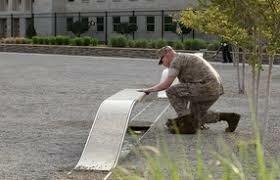 For most of the audience, Forte’s photos of the Pentagon Memorial brought additional comfort. The grounds near the Pentagon hold 184 “Memorial Unit” benches. Each bench has a victim’s age and location at the time of the attack inscribed on it. 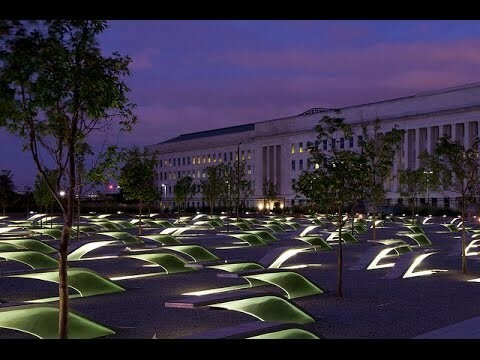 A pool of water at each Memorial Unit reflects light in the evenings. The effect is soothing and haunting. 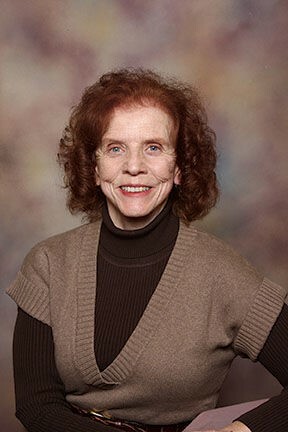 June Forte is the former curator of the Pentagon Quilts. Now she is the voice for our nation to remember and honor the victims of tragedy. A voice for a message that I was privileged to hear. “What separates us from the animals, what separates us from the chaos, is our ability to mourn people we’ve never met. 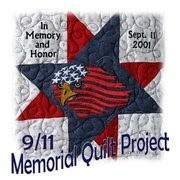 9-11, June Forte, memory quilts, Pentagon Memorial, Pentagon Quilts. Bookmark.